Fort Jackson is the U.S. Army’s main base for Basic Combat Training. Training over 50 percent of the Army’s Basic Combat Training load and 60 percent of the women entering the Army each year, Fort Jackson provides the Army with over 60,000 trained warriors who are focused on becoming soldiers with teamwork as the post’s primary mission. Fort Jackson not only trains basic recruits, but advanced training is provided as well. In fact, the U.S. Army Soldier Support Institute, the Armed Forces Army Chaplaincy Center and School and the National Center for Credibility Assessment (formerly the Department of Defense Polygraph Institute). Army’s Drill Sergeants are also trained at Fort Jackson, South Carolina. Army's Boot Camp: As the largest and most active Initial Entry Training Center in the U.S. Army, Fort Jackson trains more than 60,000 soldiers annually with Basic Combat Training (BCT) and Advanced Individual Training (AIT) at Fort Jackson. The primary mission of Fort Jackson is to provide the Army with trained, disciplined, motivated and physically fit soldiers who grasp the Army's core values and are focused on teamwork. Fort Jackson proudly accepts new challenges related to the War on Terrorism and stands ready to accept any additional mission in support of our nation’s defense. 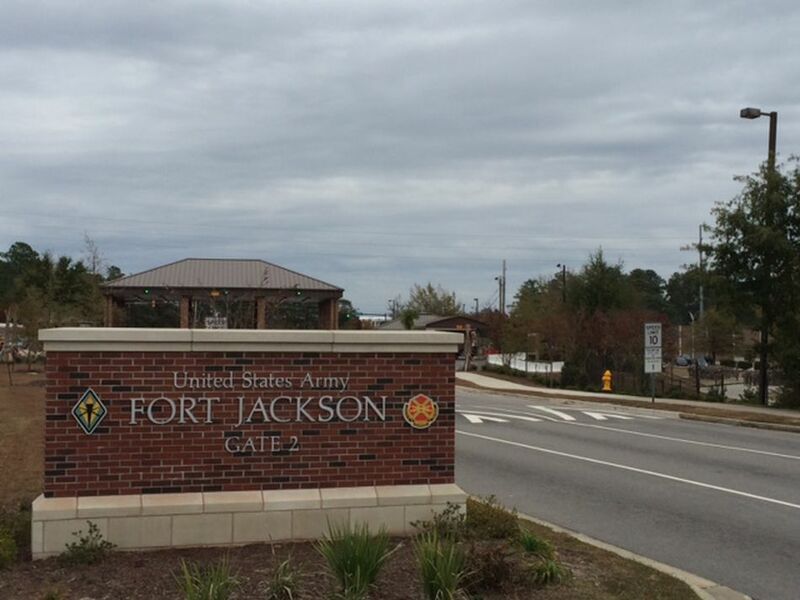 Located in the heart of the midlands region of South Carolina, Fort Jackson is incorporated into the city of Columbia. Columbia, South Carolina is a city filled with hundreds of years of history preserved in museums, churches, monuments and plantation houses. Its mild climate enables visitors and residents to take part in outdoor recreation nearly year-round. Columbia is also noted for its zoo and botanical gardens, sports, arts and local special events. The fort is situated on 52,000 acres, and has more than 100 ranges and field training sites and 1,160 buildings. Soldiers, civilians, retirees and family members make up the Fort Jackson community that continues to grow in numbers and facilities. More than 3,900 active duty Soldiers and their 14,000 family members are assigned to the installation and make this area their home. Fort Jackson employs almost 5,200 civilians and provides services for more than 36,000 retirees and their family members. An additional 12,000 students attend courses at the Soldier Support Institute, Chaplain Center and School and Drill Sergeant School annually. Fort Jackson is also home to the U.S. Army Soldier Support Institute, the U.S. Army Chaplains Center and School and the Defense Academy for Credibility Assessment. and the 120th AG Reception Battalionwhere the Initial Entry Trainees are processed. Visiting Fort Jackson South Carolina - Temporary Lodging is arranged through the Fort Jackson Welcome Center which is open 24 hours, 7 days a week. The Welcome Center is located just inside Gate 2. Fort Jackson Lodging facilities are open to military personnel (all ranks/grades), their family members, guests, and retired military and their guests. Arrangements for on-post temporary lodging, as well as referral for off-post temporary lodging can be gained from this facility. It is advised that you make hotel reservations well in advance of your arrival. During the PCS season on base lodging is often fully booked. When making reservations, make sure you keep your confirmation number with you, this is your proof of reservation, and without it your room may be assigned to someone else. Upon arriving at Fort Jackson you will need to report to the Strom Thurman Building for in processing where you will be taken to the housing office. If you elect to live on-post, a Balfour Beatty Communities representative will be there to start the application process. The average wait time depends on the size of home needed. Soldiers can move in immediately or at the most 1 week. There are currently over 800 family homes in eight distinctive neighborhoods. Single Service members with no dependents, E1 - E5 are assigned a separate sleeping room with a shared kitchen/bath in the barracks. Single Soldier's E6 and above are authorized to reside off-post. Apartments, town homes, and houses are available for rent. In some cases, Soldiers may decide to purchase. School Liaison Officer can help with any questions or concerns you may have about transitioning into the Fort Jackson schools as well as the surrounding school districts. Fort Jackson is home to two elementary schools serving grades Pre-kindergarten through 6th grade. They are administered by the Domestic Dependent Elementary and Secondary Schools (DDESS) and the Department of Defense Education Activity (DODEA). Pierce Terrace Elementary educates Pre K through 1st grade. C.C. Pinckney Elementary educates 2nd through 6th grades. These schools support children of military personnel living on Fort Jackson. Students in grades 7-12 living on Fort Jackson attend Richland District Two Schools. 7th &8th graders attend Dent Middle School and 9th-12th graders attend Richland Northeast High School. Children of military personnel living off post are supported by primarily two school districts: Richland District 1 and Richland District 2. A majority of Fort Jackson military children attend Richland District 2 schools, which consist of 15 Elementary Schools, 6 Middle Schools, and 4 High Schools. RD2 offers 15 magnet programs in various schools. Fort Jackson also has an active home school group. Child and Youth Services provides one-stop service for families interested in registering their children for child and youth services. Vacancy information and waiting lists are maintained there, as is information for all available programs. Babysitter training is offered for teens through our instructional classes program. There are two child development centers on Ft. Jackson. The Scales Avenue Center has an operating capacity for 359 children and provides primary full-day care. In addition, the center offers part-time options for parents employed on a less than full-time basis and a Part Day Preschool Program for non-working parents. On Sundays, the center provides hourly care in support of chapel services. The Family Child Care Program is a system of home-based childcare. Family members living in government housing who provide childcare for more than 10 hours per week on a regular basis are required to be certified through this program. The School-Age Services Program bridges the gap between Child Development Services and Youth Services and provides programs for youth in Grades 1 - 5. The program is DOD certified and NSACA accredited and provides transportation to and from on-post elementary schools, and designated schools off-post. Moncrief Army Community Hospital is Fort Jackson's main medical facility. It provides for more than 400,000 outpatient clinic visits and more than 5 million laboratory procedures every year. There are three hospital emergency rooms within 15 minutes of Fort Jackson. In case of emergency you will need to go to the nearest emergency room or call 911. TRICARE Prime beneficiaries and soldiers-in-training will be referred to the Specialty Referral Treatment area for urgent care. Moncrief Army Community Hospital provides acute and routine care by appointment to all TRICARE Prime beneficiaries. Life is South Carolina near the Fort Jackson base is rich with Southern culture, a large Army retirement community, and a large base complete with living amenities, medical facilities, shopping, and more.